A blog about success secrets that when applied will give you personal success, business success,academic success, etc. Success secrets for everything you can think of! Happy new week to all the success seekers. SUCCESS SECRETS wishes you all the very best for the new week. 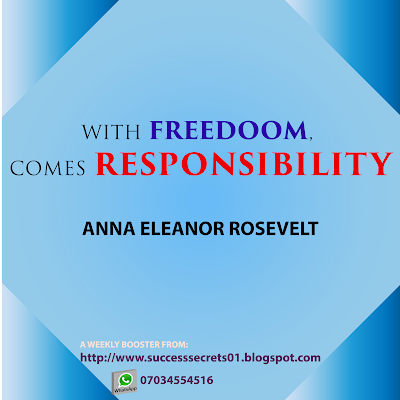 Our weekly energizer for this new week is taken from a woman who needs no introduction. She was the longest serving first lady of the United States (from March 1933 to April 1945), United States first representative to the United Nations Commission on Human Rights, First chair of the United Nations Commission on Human Rights and referred to by president Harry S. Truman, who succeeded her husband as president, as 'the First lady of the world' in glowing tributes to her human rights achievements. Without a doubt, it is obvious that a politician, activist, diplomat and wife of such pedigree understands a whole lot about Responsibility and Freedom. Therefore, when she gives us today's weekly energizer, we ought to ponder on those words. Everyone wants freedom, however, this freedom they fail to realize comes with responsibilities. 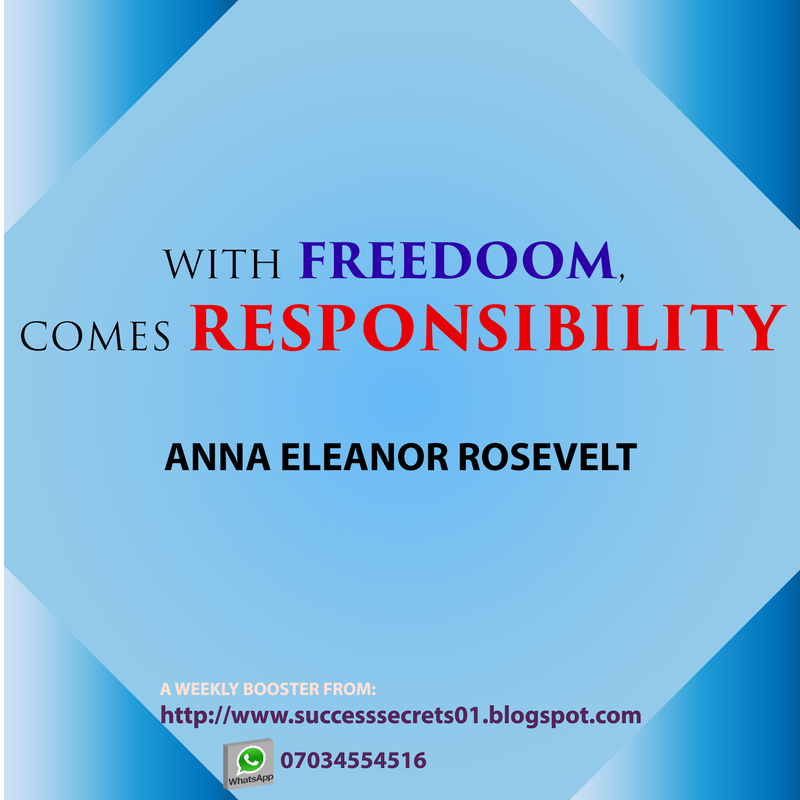 Many expect that if you are free, then you should also be free from responsibilities. Interestingly, if this truth is not understood, you can never be free. What is your take on today's weekly energizer? Feel free to drop your comments below and share your thoughts with us. Also share with your friends and loved ones. Please, ensure to check back tomorrow morning. We will update the weekly energizer with our full analysis tomorrow morning. Wishing you freedom and success for the new week! Inspirational Stories will not make You Rich or Give You Money!! EVEN YOUTUBE REJECTED AFROCANDY'S MOVIE TRAILER; NO MAN IS GOD AFROCANDY DECLARES! HOW TO SUCCESSFULLY BROWSE FOR FREE ON ETISALAT. NO SOFTWARE, NO TWEAKS! 15 MB OF DATA COMPLETELY FREE 24 HOURS A DAY. A YOUNG AND ADVENTUROUS PC ENTHUSIAST BENT ON CONSTANT IMPROVEMENT IN QUALITY AND QUANTITY OF SERVICE RENDERED.